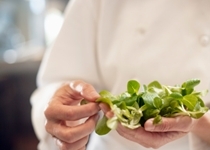 Home » Food and Nutrition » Watercress the Next Top Superfood? Watercress the Next Top Superfood? Every year, there are superfoods or powerhouse foods that grab the public’s attention. These are foods marketed for their incredible nutrient content and health benefits, and they are championed as major contributors to an overall healthy lifestyle. Everyone wants to know what the next big superfood is and which are best to throw into your juicer, blender, or side salad. Over the last decade or so, popular superfoods have included goji and acai berries, flaxseeds, chia seeds, and powders such as chlorella and spirulina. And let’s not forget the impact kale has made on the lives of many. It seems kale is at the top of everyone’s healthiest superfoods list every year. Now, there is always a lot of speculation, but what is actually the healthiest superfood of 2014 that you should include within your diet? Well, perhaps surprisingly, it’s not kale or any of the other healthy foods previously mentioned. Earlier this year, Jennifer Di Noia, an associate professor of sociology at William Paterson University, conducted a study to determine what vegetables and fruits have the highest nutrient content. The results were published in the highly touted TIME magazine and the Centers for Disease Control and Prevention’s journal, Preventing Chronic Disease. Di Noia’s study observed 47 foods and 17 nutrients that are considered important to overall health, and heart disease and cancer prevention by the Institute of Medicine and the United Nations. The nutrients in focus included protein, fiber, potassium, calcium, iron, zinc, folate, and vitamins A, B1, B2, B3, B6, B12, C, D, E, and K. Nutrients per calorie of energy on a 2,000-calorie daily diet per 100 grams of food were calculated from scientific literature about the foods studied. Six of the foods did not satisfy the expectations as a “powerhouse” food, including blueberries, onions, garlic, cranberries, tangerines, and raspberries. The Food and Drug Administration (FDA) recognizes good nutrient sources as foods with 10% or greater of the daily value for a specific nutrient. So what superfood reigned supreme? You may be surprised at what green vegetable topped the list. This superfood is often ignored, but it doesn’t mean it shouldn’t be a welcome addition to your salad, juices, or smoothies. It was watercress that had a perfect score of 100. Watercress is particularly high in vitamin K (312% of your recommended daily value per 100 g serving), vitamin C (72%), and vitamin A (64%). The top 10 superfoods also included Chinese cabbage (with a total score of 91.99), chard (89.27), beet greens (87.08), spinach (86.43), chicory (73.36), leaf lettuce (70.73), parsley (65.59), romaine lettuce (62.48), and collard greens (62.12). Where did the almighty and powerful kale land on the list? Kale was 15th of 41, with a score of 49.07. Now, I would still recommend eating lots of kale; it’s still a very healthy addition to any diet. This study just creates awareness that there are other healthy foods that aren’t marketed as heavily that are well known to pack a punch when it comes to nutrient content. It is interesting that 97% of the foods on the overall list were considered protective against chronic disease. Watercress is a cruciferous vegetable that is well documented for its cancer-fighting effects. In a single-blind, randomized, crossover study published in the American Journal of Clinical Nutrition in 2007, watercress was shown to reduce cancer risk from lowering DNA damage of lymphocytes. The study observed 30 women and 30 men with an average age of 33. During the eight-week study, participants were given 85 g of raw watercress daily. In addition to its cancer-fighting properties, watercress also increased carotenoid concentrations and altered the overall antioxidant status. It increased plasma lutein levels by 100% and beta-carotene by 33%. What are some other reasons you should eat watercress? Watercress can also help treat Alzheimer’s disease by limiting neuronal brain damage. So move over kale! Looks like you have you have some company. Di Noia, J., “Defining Powerhouse Fruits and Vegetables: A Nutrient Density Approach,” Preventing Chronic Disease June 5, 2014; 11: 130390, doi: 10.5888/pcd11.130390. Park, A., “41 Superfoods, Ranked By How Healthy They Are,” TIME web site, June 6, 2014; http://time.com/2827608/41-superfoods-ranked-by-how-healthy-they-are/. Gill, C.I., et al., “Watercress supplementation in diet reduces lymphocyte DNA damage and alters blood antioxidant status in healthy adults,” American Journal of Clinical Nutrition February 2007; 85(2): 504–510. “Nutrition Facts: Watercress, raw,” SELF Nutrition Data web site; http://nutritiondata.self.com/facts/vegetables-and-vegetable-products/2718/2, last accessed October 6, 2014. “What Is Watercress Good For?” Mercola.com web site; http://foodfacts.mercola.com/watercress.html, last accessed October 6, 2014.